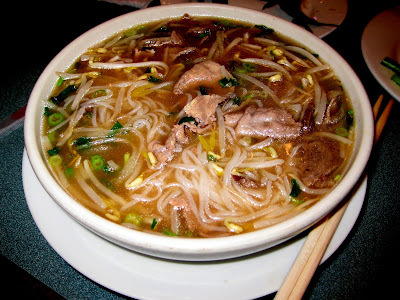 When you have a bit of a cold, there’s nothing like drowning yourself in a giant bucket of pho. So that’s exactly what we did. Before catching a film festival flick and getting a parking ticket a 9 PM on a Sunday (up yours PPA), Washington Ave was to be the street of choice. 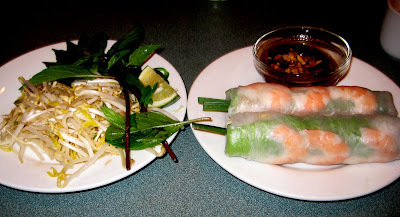 And Pho & Cafe Viet Huong was the pho place of choice. H/A got some strange rainbow ice drink. I wouldn’t exactly call it a drink. There’s very little drink, and much more chunky stuff. There’s sweet red beans, shreds of green jello, yellow mung bean, and coconut milk. I don’t think this is a drink for me. Got some rolls (Goi Cuon), as tradition always calls for it. They were pretty good, but there were tons of mint in. I like a tiny bit sometimes, but this may have been a bit too much for me. Don’t get me wrong, still good. H/A went with the pork chops on broken rice (Com Tam Suon Nuong). Holy crap, this was good. I’m totally ordering this the next time. 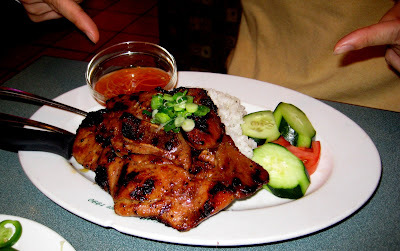 Screw the pho, now I’m all about vietnamese pork chops! But no complaints about the pho here. I got beef eye round and well done flank. After throwing in the entire pile of sprouts and the requisite sriracha, it was just what the doctor ordered. Although it was pretty ginormous and I did not finish it. Damn you sickness and my diminished appetite! The service? It’s not so great here. The place is huge and run like a cold machine. You get your food real fast, but they don’t really follow up or check on you. Then you go up front and pay. Attentiveness is not their strong suit. But that’s ok, because they’re food is good.